Ronda Rousey’s trash-talking style has made the sport of women’s mixed martial arts (MMA) much more entertaining. Rousey continues to harp on the fact that Cristiane “Cyborg” Santos is a “cheater” who was caught using anabolic steroids. Rousey even expressed concern that Santos will continue to use anabolic steroids once Santos returns early next year from a one-year steroid suspension. Rousey was recently interviewed by Bruce Buffer on the “It’s Time” show broadcast by the Sherdog Radio Network. She told Buffer that Santos’ cheating with steroids allowed her to dominate the 145-pound weight class. This made the division look bad. And no one in the weight class wants to fight Santos when she returns as a result. However, Rousey wants to fight Santos. But only if Santos drops down to the 135-pound weight class where Rousey is the reigning Strikeforce champion. Rousey admitted that she could very well fight Santos in the 145-pound class if she wanted to. But she doesn’t because she’s concerned that Santos will continue to use anabolic steroids once she returns from her one-year suspension. 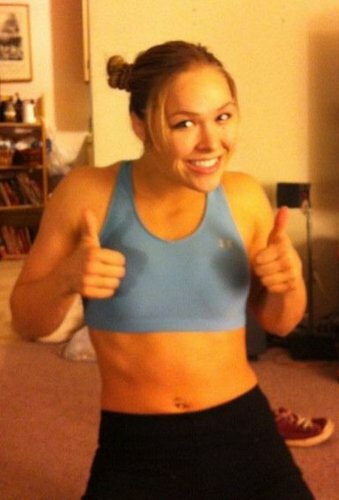 Rousey told Buffer that she has no faith in steroid testing by anti-doping organizations in MMA events. Even when Rousey won a bronze medal in Judo at the 2008 Summer Olympics in Beijing, she knew that a lot of other judokas were using steroids. And the Olympics are considered to have the most stringent drug-testing in the world. Rousey believes Santos will be less likely to be juiced with steroids if Santos competes at the bantamweight class. Santos has thus far refused to drop down to the bantamweight category citing her doctor’s advice. However, Ultimate Fight Championship’s Dana White has told the press that he is actively working on making a Rousey-Santos fight a reality – possibly in the UFC.